In 2011, when we went shopping for new guitars for ourselves, we were shocked to discover that there were no local guitar shops focused on really great sounding acoustic guitars - in the entire province! High-end hand-built guitars were impossible to find, unless you were lucky enough to stumble across a used one. Despite the economic downturn, we immediately saw an opportunity to have our own business doing something we loved and were passionate about. We then spent nine months travelling around the Western United States, visiting local guitar shops, meeting guitar builders and attending the NAMM Show where we secured our dealerships with Lowden Guitars, Santa Cruz Guitars and Huss & Dalton. We also wintered in Puerto Penasco, Mexico, where we had our Honda Element and 1974 Boler hand-painted by Antonio Geraldo. When we came back to North Vancouver, we met some of the incredibly talented local luthiers like Shelley D. Park, David Webber and Michael Dunn, and arranged to carry their instruments in our shop. We also developed a relationship with the magical Paul Iverson, who does all of our set-ups and repairs. 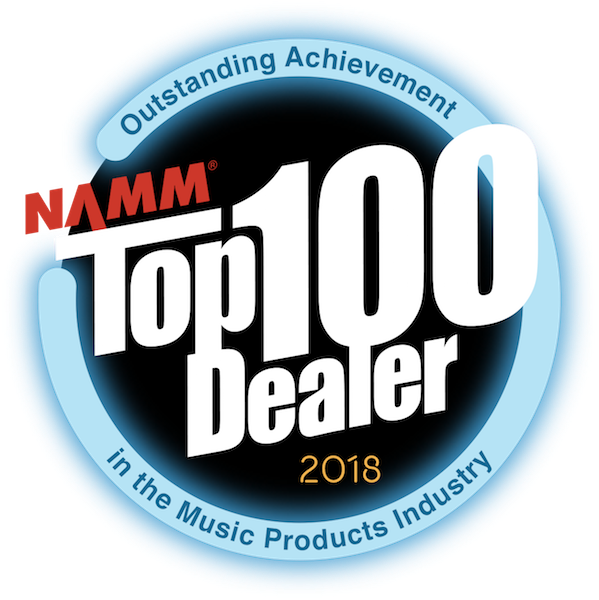 Bluedog Guitars has been the awarded the NAMM Top 100 Music Retailers Award six years in a row! Bluedog Guitars is named after Solo, our 'Blue' dog. Solo was a Louisiana Catahoula Leopard Hound Dog crossed with a fair bit of trouble. Solo was an incorrigible six month old street dog living the wild life on the mean streets of Edmonton when she was captured by the Humane Society - that's where we found and fell for her kind of trouble! Solo was a Very Bad Dog for the first years of captivity: a couch-killing, piano-eating, hole-in-the-wall-digging, full-moon-chasing, eat-the-cat kind of bad. But once we realized she could be managed with a ball, stick or frisbee, she became, shockingly, the Best Dog Ever! Always happy (except when she sensed danger and became fiercely protective), she had an exuberance for life we'd all do well to follow. Solo enthusiastically chased sticks into many of the world's rivers, lakes and oceans. She crashed through the ice on the North Saskatchewan River countless times, and loved an icy swim. She spent a few years chasing roos in Western Australia and not being eaten by sharks in the Indian Ocean. She loved her year-round swims in the Pacific Ocean and Seymour River. Her last winter was spent retired on the Sea of Cortez in Puerto Penasco, Mexico. She spent her final days helping us set up the Bluedog Guitars shop in North Vancouver - we had to let her go just a few days before our shop opened May 1, 2012. She was Best Bad Dog Ever. All of Bluedog's Shop Dogs are rescue dogs. Frida, the Chihuahua, is the Boss Dog: she's from the Barrio in Puerto Penasco, Mexico. Solo didn't particularly enjoy the company of puppies, but she liked Frida's bad attitude, and passed the baton to her when Frida was just four months old. Sassafras is a Maltese/Yorkie/Chihuahua troublemaker from Collar of Hope Rescue in Tacoma, Washington (Sassy was dumped in a field alongside her mother and siblings in Riverside, California). Sassy is a little goofball who love to play. Our newest team member is Djangus, an English Bull Terrier X, also from Collar of Hope Rescue. He's a very sweet guy who gets along well with skunks, goats, sheep, racoons, and most importantly, Chihuahuas. Deacon was our 100 lb. Pit Bull/Mastiff cross from the RSPCA in Perth, Western Australia - we had to let him go to the great off-leash park in the sky in 2016 at the age of nine.